Note: here are not given the tools, which are used rarely (percept), or on the basis of which more powerful things are built (ttb). An overview of all the tools would be very time-consuming. And I doubt that normal Erlang programmer may need all of them anyway. Far more important is to know four or five, and based on the results, obtained during profiling, be able to find bottlenecks and decide, whenever they should be fixed or not. Like it or not, you need to know one or two standard tools. fprof’s output can be converted into the format suitable for kcachegrind (see below) using the erlgrind. You can find explanations for each command above in the standard docs and also here. The sequence of steps is quite simple and described in the project’s README. Then copy the resulting file: appname.trace to our machine (before that we gzip it because of it’s size). On our machine, we transform it into the text format, suitable for kcachegrind. After the conversion has finished, we may begin analyzing the results. percentage relative to its parent (“Relative to Parent”) is even better, otherwise, you can’t understand the damn thing. “No Grouping” and “Function Cycle” do not give a clear picture of what is happening. The first option leads to the top lines: gen_server:decode_msg, gen_server:loop, and only indicates that more time spent in gen_server:* - thank you, captain! I didn’t understand the results of the second option. 1> eflame2:write_trace(global_calls_plus_new_procs, "/tmp/ef.test.0", all, 10*1000). According to the docs, we need to run tracing in a separate process. But when I’d tried to do so, I got “Segmentation fault”. Time should be equal to Time1 + Time2, right? Well, not in reality. Time is often greater than Time1 + Time2 (even if I measure it, say 100 times). 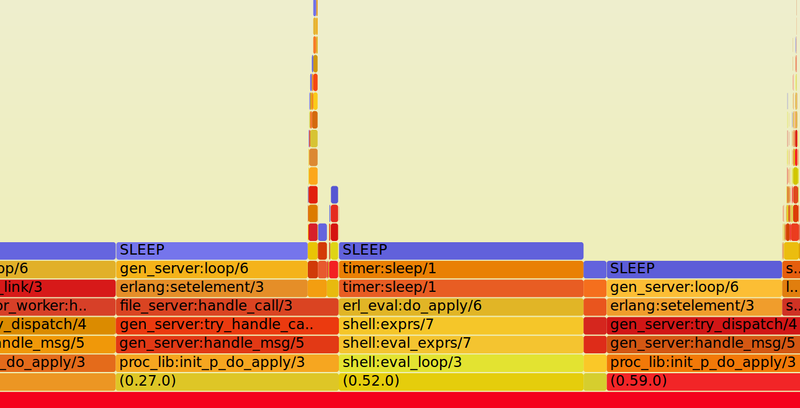 I think it is because timer:tc uses os:timestamp and Time includes some switching (when scheduler runs other process).